The Biggest Loser was NBC+s surprise hit of the Fall 2004 television season, drawing a passionate audience and prompting people nationwide to start their own Biggest Loser competitions. This unscripted weight-loss drama was based on overweight contestants competing to lose weight and win a quarter of a million dollars with the help of a team of doctors, dietitians, and trainers Bob Harper and Jillian Michaels.On the evening that the first season+s finale aired, legions of fans went to the NBC Web site to look for the diet and fitness plan that the contestants used. It wasn+t available to the public-until now. 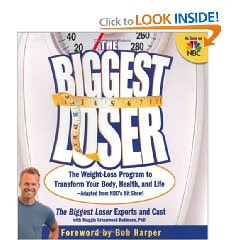 With this book, people looking for change can accomplish the same type of radical makeover of their bodies, their health, and their lives that they saw on The Biggest Loser.The book features the food and fitness plans from Bob and Jillian, health advice from the show+s medical experts, and motivational tips from the contestants themselves. The contestants+ compelling stories and reasons for losing weight, dramatic before-and-after photos, and real-life advice provide the inspiration and upbeat attitude that made this show a smash hit. --This text refers to the Paperback edition.